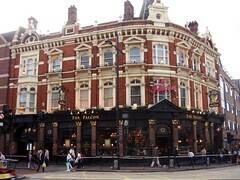 A large, imposing Nicholson's pub near Clapham Junction Station. The interior is divided into a number of smaller areas which spread around the bar, with interior dividing walls to separate them. Its very long bar (claimed to be Britain's longest) usually has half a dozen or so real ales, plus many of the other usual drinks photo. They do seem to change the ales around — in February 2008 they had Black Sheep (£2.70), Spitfire, Bombardier, Harveys Best, Landlord, and Deuchars IPA; in November 2008 they had Spitfire, Broadside, Stonehenge Eye Opener, and another one; and in March 2010 they had Ringwood Fortyniner (£2.95), Slater's Top Totty, UBU Purity, Thornbridge Kipling, and London Pride. When Kake and Jo visited on a Monday evening in March 2010, the place was pretty much packed, with people coming and going, presumably at least some of them en route home via Clapham Junction. The atmosphere was friendly, though it did take some time to get served. Typical pub food, at typical prices, is served lunchtimes and evenings. Note: As of June 2011, according to the Pubs Galore comments linked below, the back room has been turned into a dedicated restaurant area. We don't know if the food has changed. It has big screens for major sports events (Champions League, rugby internationals, etc.). Accessibility: Level access via at least one of the entrances (small ridges but no steps). Level access from this entrance to the toilets as well, and there's a dedicated accessible toilet with RADAR lock. Do note though that if you go in the "wrong" entrance then you'll be separated from the toilets by the interior dividing walls, and it's a bit tight to get through one of these. Also, they don't always serve along the full length of the bar, so it may be difficult to buy a drink from the part of the pub that has proper toilet access. Last visited by bob, June 2013. Last edited 2017-09-15 17:28:21 (version 31; diff). List all versions. Page last edited 2017-09-15 17:28:21 (version 31).